The Tex Files - Home of Arianne 'Tex' Thompson: Do You #SFFpit? Yeah, that's right. I took a hashtag and used it as a verb. And I'm not even sorry. SHOTS FIRED. Come at me, world. "#SFFwhat? What are you even talking about?" Why, I'm so glad you asked! 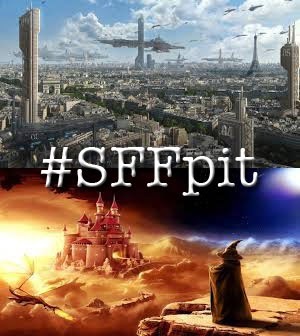 #SFFpit is a new Twitter pitch contest, the feverish brainchild of my good buddy and fellow Red-Sofist Dan Koboldt. YES, dammit, another one! Because this one is specifically for sci-fi and fantasy for every age, from picture books through adult works. Just think about all those adorable picture books with pettable touch-n-learn hobbit feet, and colorful finger-socks you can wiggle to make the alien burst out of John Hurt's stomach. "But I have profound moral objections to Twitter pitching! Why should I try to cram the essence of my novel onto a virtual post-it note designed for people with the attention span of a sperm?" I don't know, hypothetical objector! But stow your Hatorade and think of it this way: the more avenues we open for people to make a great first impression with agents (query letters, conference meetings, Twitter pitches, whatever), the more opportunities you have to find a format that lets you shine. And that's good for everyone. "If you say so. When is it, anyway? Asking for a friend." Tell them it's June 11th, from 8 AM to 8 PM CST. And then tell them to get over to Dan's #SFFpit homepage to get all the rest of the sweet deets! Seriously, do it before Gandalf wastes Coruscant. Also: big apology who's everybody who's waiting to hear back from me. I owe emails like Bunny Lebowski owes money (which is to say, all over town.) And I keep thinking, "oh, I just haven't had time," but the truth is that I have - I've just been spending it on other things. Workshop Wednesdays and IHOP carouses and lunch dates and dinner flings and hours-long chats with some of the most fabulous people in the world. Which should not imply that the aforesaid people are any more fabulous than the ones whose loving missives have lingered in my inbox... only that after spending months sitting by myself chained to a computer, the feeling of being finally let off the leash has been, shall we say, overwhelming. I really appreciate y'all's patience while I've been out chasing squirrels and catching frisbees, and will do my very best not to need too much more of it! If you lose your cow you should report this to the Watch under the Domestic & Farmyard Animals (Lost) Act of 1809. They will swing into action with keenness and speed. Your cow will be found. If it has been impersonating other animals, it may be arrested. If you are a stupid person, do not look for your cow yourself. Never try to milk a chicken; it hardly ever works. Glad to hear you're out galavanting around and enjoying yourself, scoping out the outside world for those of us who are still in the trenches. Go, fly free!! Tex, thanks for posting this! As always, you add a certain flare to things. Ha! You're so diplomatic. It's a genius idea, sir, and I'm glad to help out! Ohhh! I hate not being ready to pitch!! But I'm sure, like other Twitter pitches, it will come back around, right? AS WELL SHE SHOULD. It's a sign of first-class parenting!